Irvine, Calif. — Ware Malcomb announced its support of a new interactive summer exhibit at Pretend City Children’s Museum called “Dream it, Draw it, Build it.” Ware Malcomb provided pro-bono design services for the exhibit, which runs through September 3, 2018. 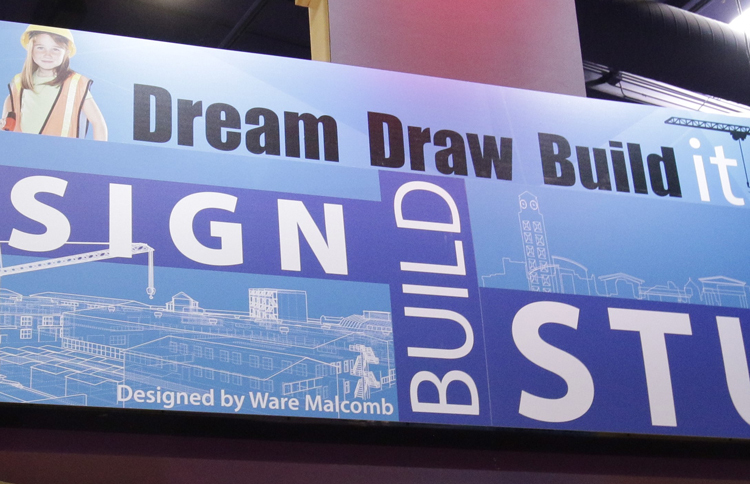 The “Dream it, Draw it, Build it” exhibit features three activity zones, each representing various aspects of the architectural design process. Zone 1 (Inspiration/Process/Methodology) is where children can bring their dreams to life with a dress-up corner and inspiration wall. In Zone 2 (Drawing/Planning/Thinking) kids experiment with drafting tools and explore brainstorming processes during the initial stages of design. Finally, in Zone 3 (Applying/Building/Materiality), three free play activities are available for kids to collaborate, experiment, and take the sketches they created in the previous zones and bring them to life. Ware Malcomb client Ganahl Lumber generously donated the lumber for the project. For more information, visit https://www.pretendcity.org/dream-it/.